The students are trained and prepared for National Institute of Open Schooling (NIOS) X standard exams. Pre vocational training is provided to children within the age group of 13 to 17 years. The main objective is to impart training for the development of functional academics, social skills, safety and work readiness skills thus preparing them for vocational class. Students over the age of 17 years are trained in the vocational class. The aim of vocational training is to develop and impart life skills to the students which will enable them to be integrated within society by means of employment and to make them economically independent. - To develop work habits and right attitudes towards work. - To impart training for development of personal skills, social skills and functional academics. - To enable the students to successfully generalize the skills learnt in a classroom environment to daily life and work situations. - To develop skills to work in a group or as a team. - To train the students to make quality products independently. The products include files, envelopes, paper bags, gift bags, greeting cards, dusters, jewelry, bookmarks, pen stands and hand painted dupattas and handkerchiefs. Weaving (loom) is taught as a part of vocational activities. The focus is behavioral training and skills development. 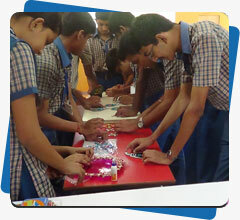 The students are trained for academics and to perform vocational activities according to their abilities. Special educators plan an Individualized Education Program (IEP) for each student. The IEP sets personalized goals for the student and is tailored to the student's individual needs and abilities. 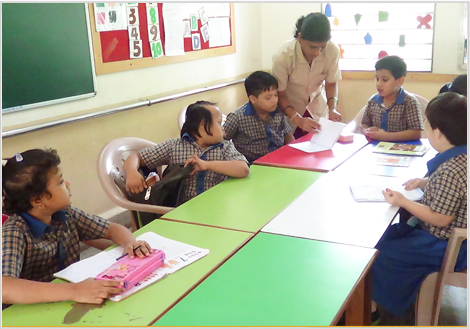 Monthly Parents meetings are conducted to ensure that the parents are actively involved in the child's education. It also aids in the collaboration between the teachers/therapists agenda and lesson plans with the parent so that the skills being introduced in the classroom are being reinforced at home. The IEP includes every aspect of the student's development and there is equal emphasis on self help skills, motor skills, cognitive skills, social skills, life skills, communication skills and leisure skills. The student teacher ratio is maintained at 6:1. The students are encouraged to participate in all co-curricular and extracurricular activities. These include educational visits, excursions, educational camps, sport events, competitions and cultural programs. Students over the age 17 are trained in vocational class. The aim of vocational training is to develop and impart life skills to the students which will enable them to be integrated within the society by means of employment and to make them economically independent. To develop work habits and right attitudes towards work. To impart training for development of personal skills, social skills and functional academics. To enable the students to successfully generalize the skills learnt in a classroom environment to daily life and work situations. To develop skills to work in a group or as a team. To train the students to make quality products independently. The products include making of files, envelopes, paper bags, gift bags, greeting cards, dusters, jewellery, bookmarks, pen stands, hand-painted dupattas and hand-painted handkerchives. Weaving (loom) is also a part of vocational training. The vocational class currently is focused on training the students to make quality products independently. Every class has been allotted a vocational activity by the vocational in charge teacher, according to the level and ability of the students who are tained by the class teachers. The final goal is to ensure that the students learn to make the products independently which will be displayed during the Diwali Mela and exhibitions. With an aim to mainstream our students successfully in the Society; we have taken the initiative of introducing the subject of House Keeping along with the other academic subjects. A special curriculum was developed by the teachers, adapting basic, practical-based topics which are focused on the pre-requisite skills for Housekeeping. This includes topics such as Personal Hygiene, Grooming, Time management, Numeracy skills, listening and conversational skills, Cleaning, Room Service and Inventory. This has made our students aware of the industry requirements and they also realised the importance of having good communication skills, importance of making quick decisions, fluency in English language and adaptive skills required in this industry. A life skills curriculum works along with the student’s educational plan and blends academic, daily living, personal/social, and job skills into integrated lessons designed to help students with special needs learn to function independently in society. As a step in this direction we have introduced an hour of ‘Life Skill’ every week. Students are taught skills and values such as Shopping and money management, grooming and personal care, food preparation, transportation, Gender Equality, Dignity of labor, Safety awareness and Body Boundaries. 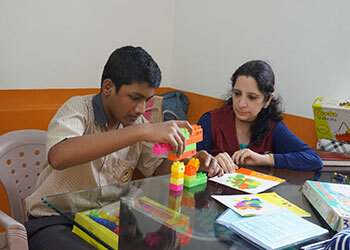 We take pride in providing the right guidance, love and support much needed for all mentally challenged children to excel in life. A 13 year old girl who is multiple handicapped with weak motor skills, has been diagnosed with myelomalacia or spinal cord disorder. A child with a case of hyperkinesia with mild mental retardation, was a hyperactive child with plenty of behavioral issues when he started with occupational therapy treatment.